Courtney Barnett sings songs like curlicues. They start straight before bending up and around, messily and unmanageable, loose swirls gathering up around the edges of a page, spindling beyond the margins. They’re full of non sequiturs or contorted aphorisms, and they lope along with all the eagerness of grazing cattle. Barnett is a lot like her songs — slyly smart and a little awkward and peeling at the seams. She sometimes seems a bit dazed, but is probably just bored. Last Friday, she sat on the great lawn away from the scrum of an AFI set at the Coachella Valley Music and Arts Festival and tried to accept the moment. Barnett is 26 and from Melbourne, Australia, and at the beginning of that curious moment in a career, surrounded by big deals — Pharrell, Lorde, Skrillex, Muse — but still a small, intimate performer with just a stroke of visibility. She was a bartender last year, and now Barnett and her three-piece band have claimed early afternoon Sunday sets on consecutive weekends of the massive festival, squeezing her intimate and incisive songs into Indio’s scorched setting. In the early hours of the festival, people mill about, identifying taco stands and admiring oversize astronaut sculptures. Not everyone pays attention to nuanced songwriting, or much of anything really. Barnett does at least one thing well. Her “Avant Gardener” has become the curlicue she’s best known for, an ambling dash of oscillating guitar tones and that matter-of-fact storytelling winding into unlikely punch lines. (“The paramedic thinks I’m clever ’cause I play guitar / I think she’s clever ’cause she stops people dying.”) In her sleepy tone — not so much disaffected as actually shy two or three hours of solid REM — she sings of one very bad anaphylactic seizure. It’s not scary — “I’m not that good at breathing in,” she sings at one particularly self-defeated moment — just sort of hapless. And it reels you in. Weird is fine. There are few gambles when it comes to landing a song in rotation on Sirius XMU or a Best New Track designation from Pitchfork, benchmarks of indie entry success. The bar is basically “be good.” And so it’s not so strange that Barnett has touched success. But it’s early yet, and she seems too nice and dismayed by herself to indulge the conversations she’ll be forced to have soon. She wears black denim and black Doc Martens and a black silk-screened Highway 61 Revisited tee (some critics have drawn Dylan comparisons, though that feels weak, T-shirt notwithstanding). It’s an uncommon rock uniform for this headdress-and-romper setting; her unfussed-over hair is a bit like a soft, freshly stitched bird’s nest. “Avant Gardener” is the breakout from The Double EP: A Sea of Split Peas, a fusing of her first two releases that arrived digitally last year on her label, Milk! Records. The physical release finally arrived last week, and Barnett just signed with a bigger label — the tastemaker-ized Mom + Pop, home to bands like Sleigh Bells and Cloud Nothings. She just finished recording her first full-length album, due later this year. Last week, she also released a video for “Anonymous Club,” as sweet and hushed-over as she gets on The Double EP, her voice lilting into Cowboy Junkies’ Margo Timmins or early Lucinda Williams territory. The video is filled with carefully drawn monsters inside of other monsters, nesting dolls of under-the-covers childhood terror. That it is. 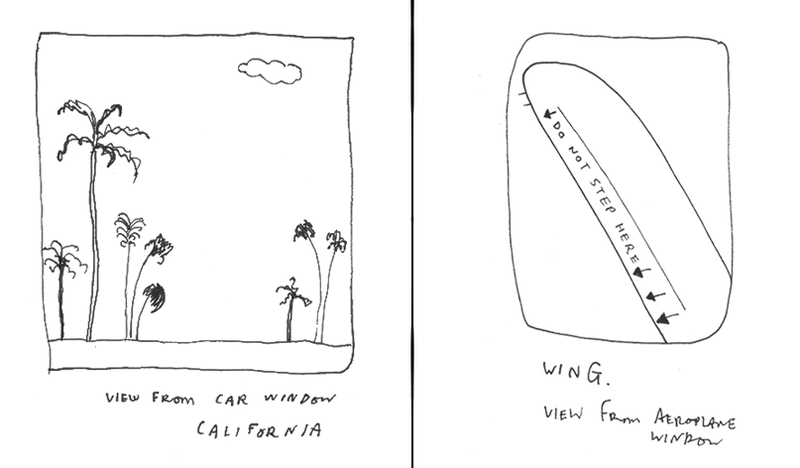 When you buy a copy of The Double EP, you’ll receive a hand-drawn zine, A View to a Gig, from Barnett, a series of pencil sketches of what she saw from airplane windows and car windshields and in the reflection of the American sun she’s been enduring for the last few months. (She draws all her own album art, too.) Next she goes on a world tour. Then she’ll come back to the States, to begin again with that new album. Some momentum for the moment. Until then, look at the sketches like the songs — imperfect and a little cracked, but indescribably accurate. The trees spill just outside the margins.